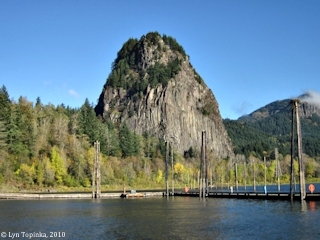 Click image to enlarge Beacon Rock, Washington, as seen from boat dock. 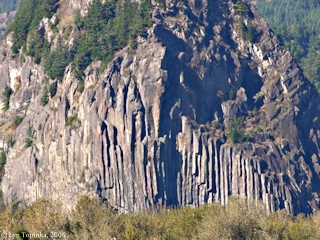 Beacon Rock is a large 840-foot-high basalt plug. 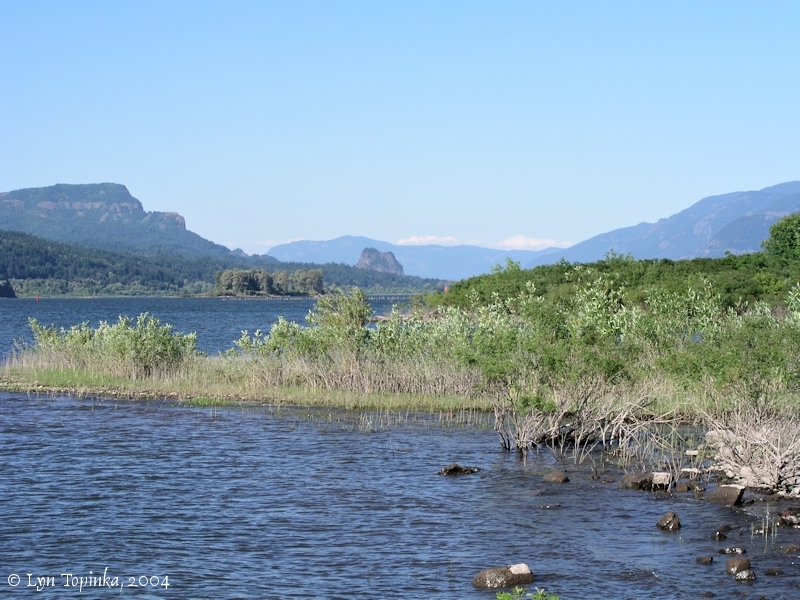 The Missoula Floods eroded away the softer outer material. 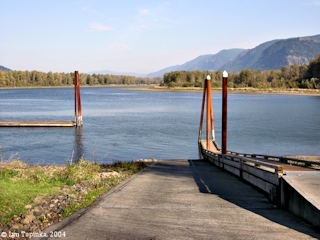 View from Beacon Rock boat dock. Pierce National Wildlife Refuge is at the waters edge. Image taken November 2, 2010. Beacon Rock is located on the Washington State side of the Columbia River at River Mile (RM) 142, near Skamania and Skamania Landing. 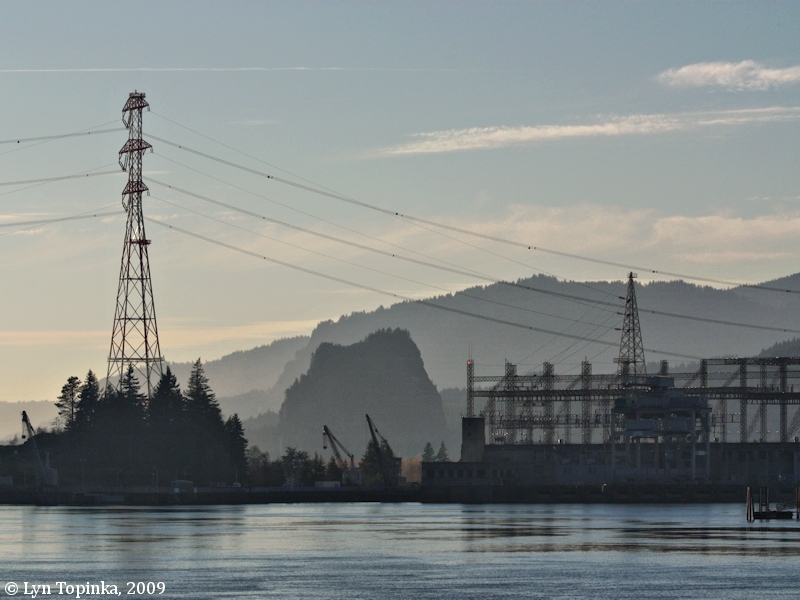 Just upstream is Hamilton Island, and four miles upstream is Bonneville Dam. Downstream are located Woodard Creek, Duncan Creek, Skamania Landing, Franz Lake National Wildlife Refuge and St. Cloud Wayside. Along the river beginning at the base of Beacon Rock and heading upstream is the Pierce National Wildlife Refuge. Pierce Island lies just offshore along the Washington side of the Columbia. Hamilton Mountain and Aldrich Butte are nearby. While Lewis and Clark referred to the feature as "Beaten Rock" and "Beacon Rock", early setters called it "Castle Rock". Research on Beacon Rock finds it one of the youngest Boring Lava cones. 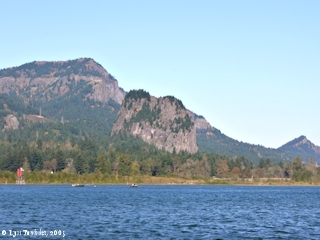 Another young Washington State Boring volcano is the maar at Battle Ground Lake, located west of Beacon Rock. Between 12 and 15 thousand years ago the Missoula Floods eroded away the softer outer material leaving visible the harder rock. 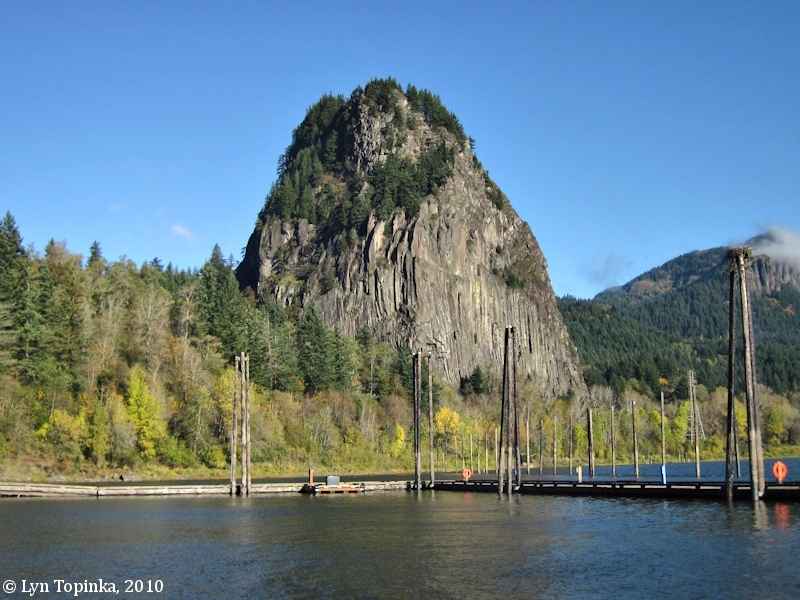 Click image to enlarge "Nothing left but the core" ... Beacon Rock, Washington, as seen from boat dock. 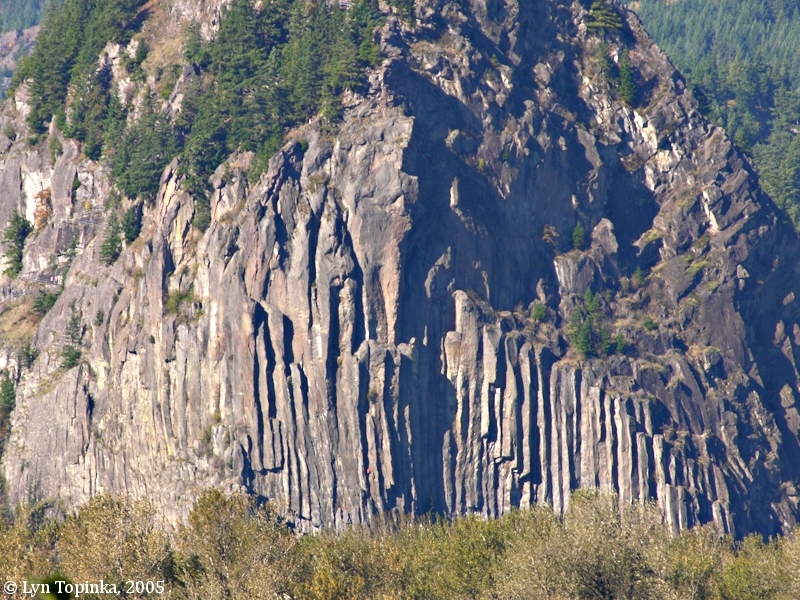 Beacon Rock is a large 840-foot-high basalt plug. The Missoula Floods eroded away the softer outer material. Image taken November 2, 2010. 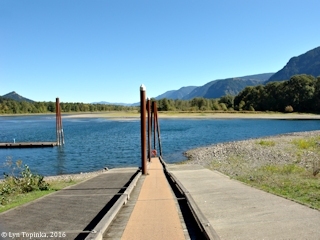 Click image to enlarge Beacon Rock basalt, as seen as Beacon Rock boat launch. Image taken October 27, 2004. "The Indians of this region were, no doubt, well acquainted with the rock, but there is not a particle of evidence that they ever climbed it, or used it for signalling purposes. indeed, even had they been capable of the feat of ascending the rock, their superstitious fears would probably have kept them from doing so. That they had such fears is evidenced by the warning an old Indian, living near the Cascades, gave us shortly after work had been commenced on the trail to the summit of the rock. It will be rememebered that the year 1916 started with a succession of violent sleet and rain storms. This old Indian told us the bad weather was a sign of the anger of the gods, anger caused by our having blasted on the rock. The Cascade Indians called the rock "Che-che-op-tin," but they could not explain the meaning of this name, which was, no doubt, given to it by some more ancient inhabitants of the region which they displaced. Perhaps another fact might be taken as evidence that the rock was considered a sacred spot by the Indians: In 1904 some carved wooded figures, resembling "totems" were found at the base of the cliff, on the east side of the rock, and at a place where the cliff overhangs. These figures ... are about three feet high, and shows traces of red and black coloring. In the narrative of the Lewis and Clark expedition mention is made of the Indians near the Cascades having in their abodes similar figures, which they adorned with trophies of war and the chase." Source: Henry J. Biddle, 1924, "Beacon Rock on the Columbia, Legends of Traditions of a Famous Landmark", a monograph written for "The Spectator", Portland, Oregon, courtesy Oregon State Libraries, 2016. 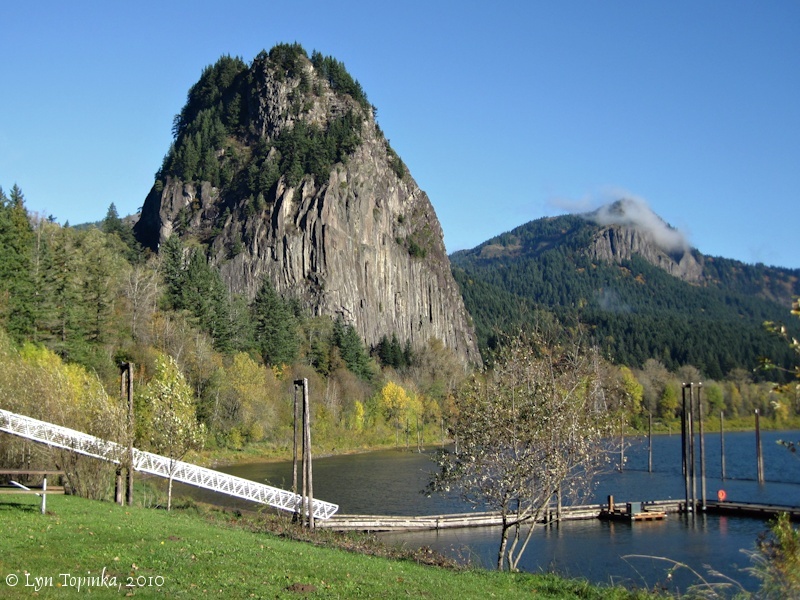 "The first recorded owner of Beacon Rock was Phillip Ritz, a pioneer who came to Oregon in 1850. He sold it in 1870 to a Philadelphia banker named Jay Cooke, a backer of the Northern Pacific Railroad, who sold it to Charles Ladd in 1904. 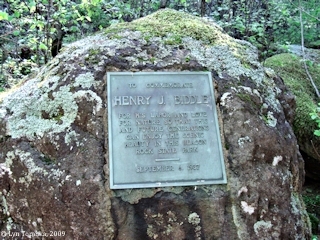 Ladd sold the rock to Henry J. Biddle in 1915 on the condition that the rock be preserved. 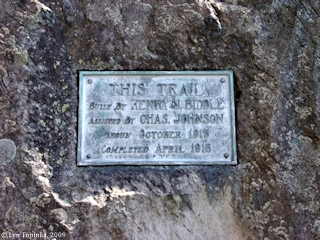 Biddle's sole reason for buying the rock was to build a trail to its summit; he was attracted by the idea of building a trail "in perhaps the most difficult location in which a trail had ever been built". Biddle's trail would not result in the first climb to the summit, however. That honor went to Frank J. Smith and Charles Church of Portland, and George Purser of White Salmon, in 1901. 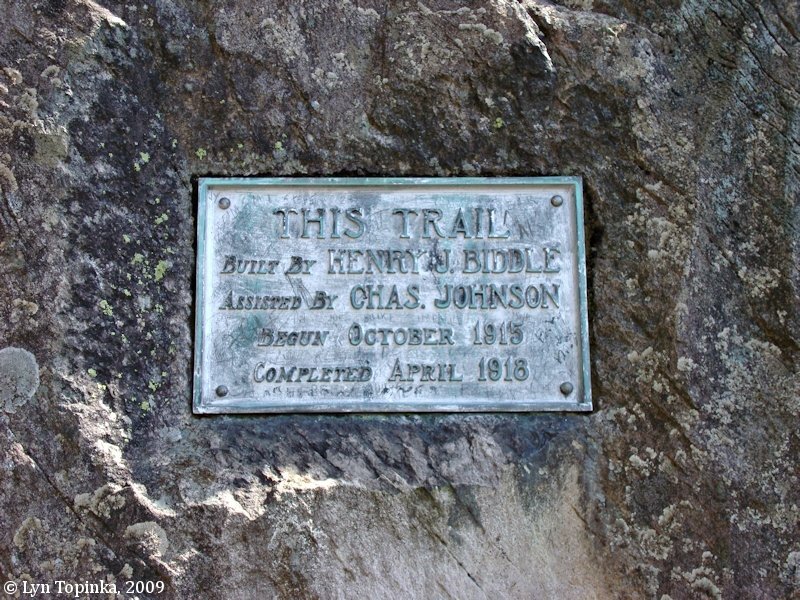 In late 1915 Biddle hired Charles "Tin Can" Johnson, who had previously been employed as a construction foreman on Highway 30 (Columbia River Highway), to build the trail to the top of the rock. It was completed in April 1918, extending a length of 4,500 feet from the North Bank Highway (now Highway 14) to the top of the rock. 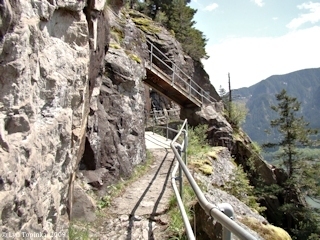 The trail was 4 feet wide, with a maximum grade of 15 percent, and included fifty-two hair-pin turns and twenty-two wooden bridges (the bridges were later replaced with steel). After the trail was complete, Biddle maintained it for public use, without charge." Source: K.G. Hay, 2004, The Lewis and Clark Columbia River Water Trail, Timber Press, Portland. 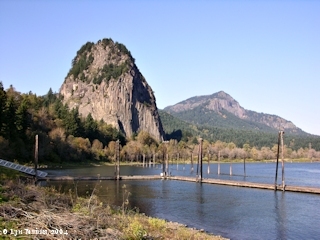 Beacon Rock has gone by many names since the journey of Lewis and Clark. 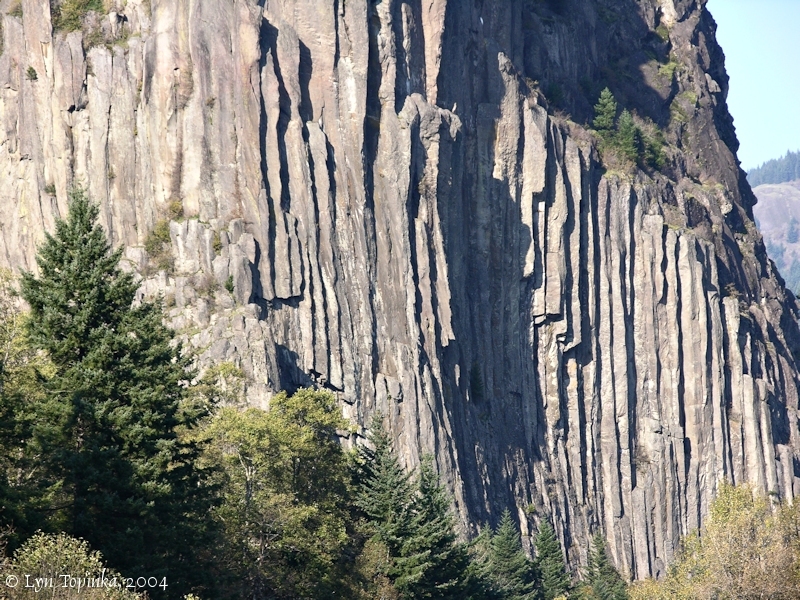 Names included "Beaten Rock" and "Beacon Rock" (Lewis and Clark), "Pillar Rock" (Rev. Parker), "Inoshoack Castle" (Alexander Ross), "Castle" (Charles Wilkes), "Castle Rock" and "McLeod's Castle" (James Alden). In the heyday of the Penny Postcard, "Castle Rock" was in use. In 1916 the United States Board of Geographic Names made official "Beacon Rock". On October 31, 1805, Lewis and Clark saw Beacon Rock and in his journal, Captain Clark called it "Beaten Rock". 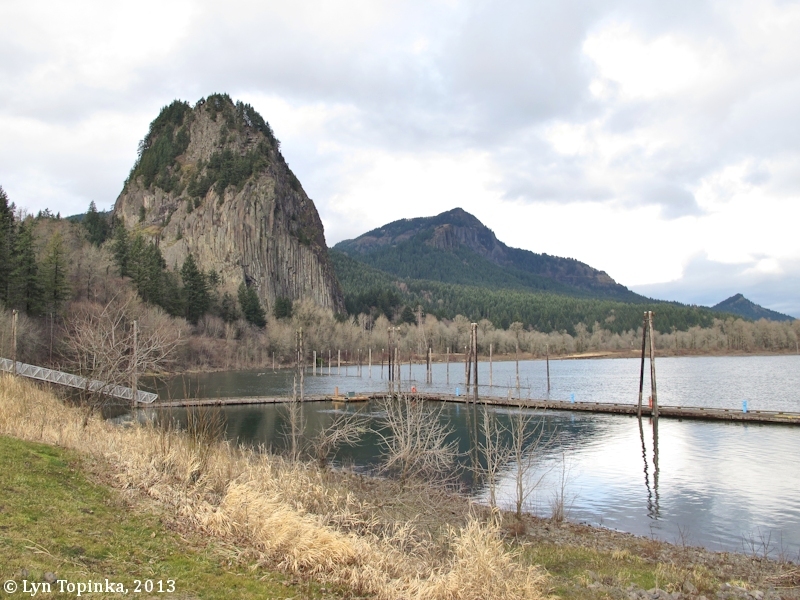 It was near Beacon Rock that they first measured tidal influences from the ocean on the Columbia River. 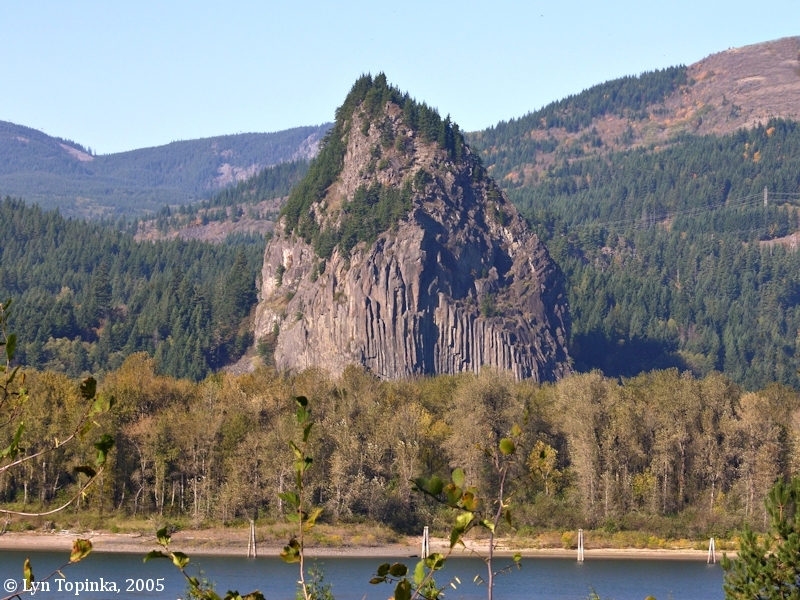 It wasn't until Lewis and Clark's return in 1806 was the feature referred to as "Beacon Rock". In 1811 Beacon Rock was called "Inshoack Castle" by Alexander Ross of the John Jacob Astor expedition. "... We left camp at 7 ock and made 4 miles to breakfast and in 7 mils more the foot of the Cascades our breakfast was made on a small island abreast of a rock rising perpendicular from the bed of the river as I should think 400 feet high Lewis & Clark call it I think 700 feet this rock is nearly surrounded by the waters of the river ..."
In 1837 Reverend Samuel Parker gave a description of Beacon Rock, which he called "Pillar Rock", in his publication "Journal of an Exploring Tour Beyond the Rocky Mountains". "Brant island" is possibly today's Hamilton Island, and the "extraordinary cascade of water" may be today's Multnomah Falls. "... Toward the lower part of Brant island I re-embarked, and we proceeded a few miles farther and encamped below Pillar rock, over against an extraordinary cascade of water which descends the mountains from the south. Pillar rock is of basaltic formation, situated on the north side of the river, a few rods from the shore, on a narrow strip of rich bottom-land, wholly isolated, rising five hundred feet, on the river side perpendicular, and on the others nearly so. Upon all, except the river side, there are some very narrow offsets upon which grow some cedars, and also a very few upon the highest point. The base in comparison with the height, is very small, giving the whole the appearance of an enormous pillar. This is one of the astonishing wonders of volcanic operations. ..."
In 1841 Charles Wilkes of the U.S. Exploring Expedition called Beacon Rock simply "Castle". In 1857 James W. Alden painted a watercolor of Beacon Rock and called it "Castle Rock or 'McLeod's Castle', right bank of Columbia River. (Cascades of the Columbia)". The painting was part of the Northwest Boundary Commission, established in 1856 (finishing in 1869) to survey the 49th parallel, today's boundary between the United States and Canada.. Alden accompanied the survey in the 1860s sketching landscapes along the route. Beacon Rock was called "Castle Rock" for many years (see "The Golden Age of Postcards" below). 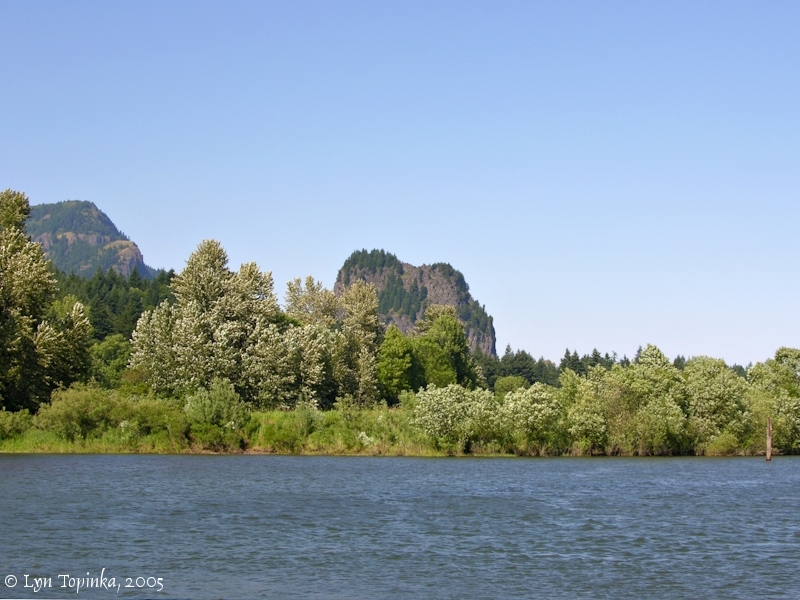 Confusion arose however with another Castle Rock, located along the Cowlitz River. 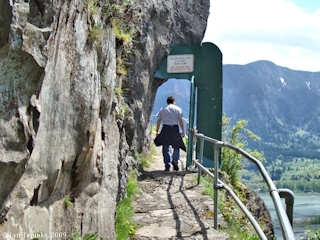 In 1916 the United States Board of Geographic Names made official "Beacon Rock". "For nearly a hundred years after the first white man saw the rock, no one seems to have made any serious attempt to reach its summit. Then on August 24, 1901, Frank J. Smith and Charles Church of Portland, and George Purser of White Salmon, made the ascent. These first climbers showed great skill and courage; after they had placed spikes and ropes at the most difficult places, the task was naturally made much easier. They were follwed by many others, among whom was Mrs. Frank J. Smith, the first woman to make the climb." 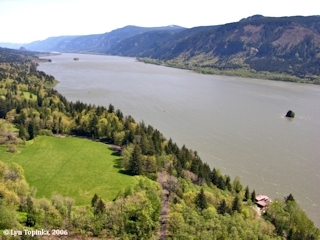 "... At 153.2 m. BEACON ROCK, across the Columbia (R), is seen. Alexander Ross, the fur trader, called it Inshoach Castle. A landmark for river voyagers for more than a hundred years, it is now surmounted by a beacon to guide airplanes. A stirring chapter of Genevieve: A Tale of Oregon relates dramatic events that took place on its summit. A foot trail has been carved in its side from base to crest. ..."
Click image to enlarge Beacon Rock, Washington. Hamilton Mountain is on the right. Image taken September 26, 2016. Click image to enlarge Beacon Rock and Hamilton Mountain, Washington. Image taken October 27, 2004. Click image to enlarge Beacon Rock and Hamilton Mountain, Washington. Image taken January 31, 2013. Click image to enlarge Beacon Rock, Washington. Image taken July 2, 2006. Click image to enlarge Beacon Rock, Washington. Image taken November 2, 2010. "... The rock ... was climbed for the first time in 1901, by men who left spikes and ropes in place for others. In 1914, a group of 47 Mazamas made the trip. In that same year, Henry J. Biddle, a prominent engineer from Philadelphia, bought the land (for $1, legend has it) from Charles E. Ladd of the banking family that gave us Ladd's Addition. 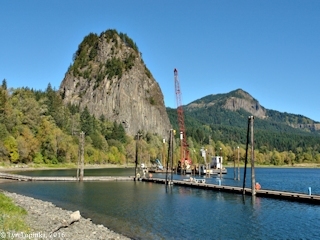 Ladd had bought the land from men who intended to blast Beacon Rock to bits for jetty material. 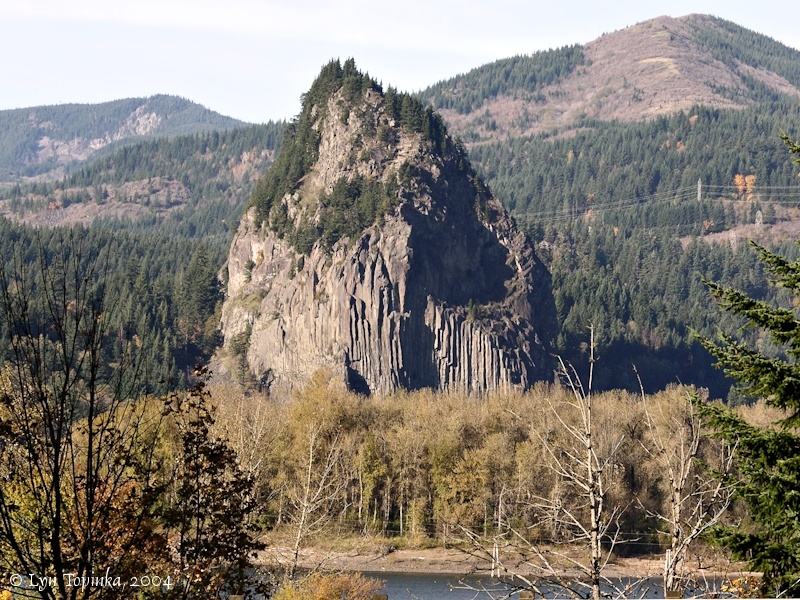 A century after Lewis and Clark described and named it, Beacon Rock itself was set to be destroyed in 1904. 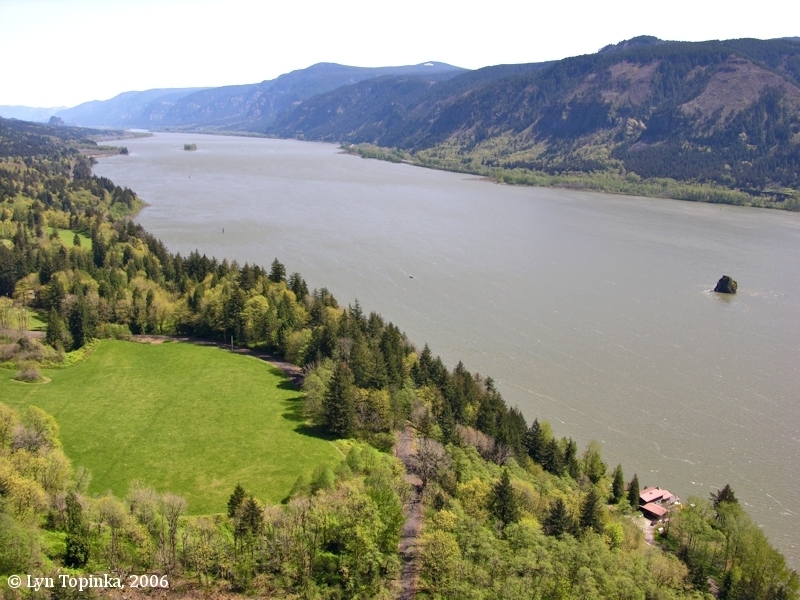 There is evidence that the effort to blow up Beacon Rock was under way when Biddle bought it. Plunkett (Eric Plunkett, superintendent of Beacon Rock State Park) says he's found "a blast star" on the southwest corner. And, he says, three tunnels at the base on the south side were dug to put explosives in. 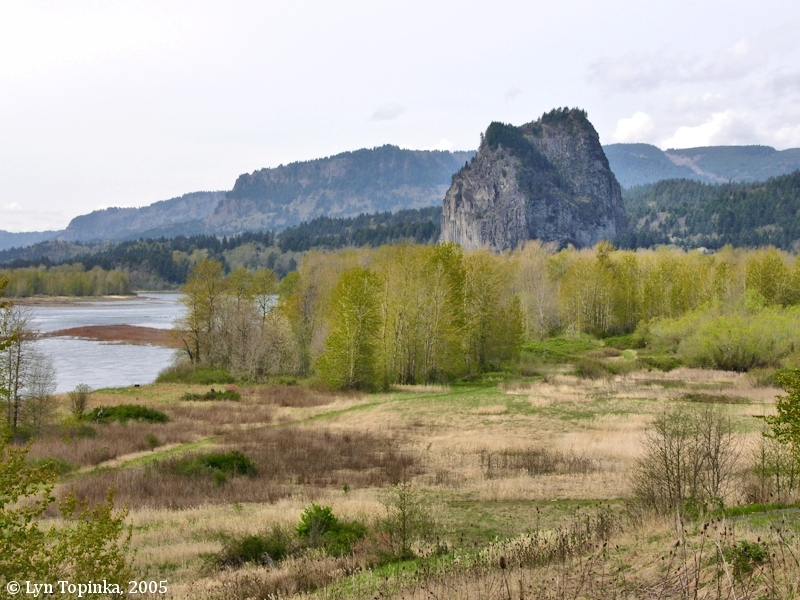 ..."
Click image to enlarge Beacon Rock, Washington, as seen from road to Warrendale, Oregon. Image taken November 4, 2004. The Beacon Rock Campground was built by the Civilian Conservation Corps (CCC) between 1939 and 1941. 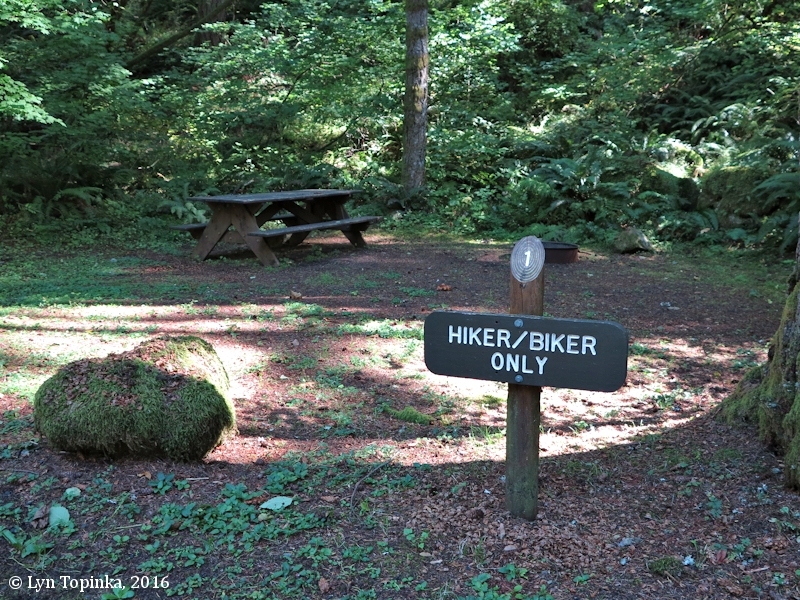 Nestled in the forest, it features 26 tent camping spots, some of which are reserved for hikers and bikers (the Pacific Crest Trail passes nearby). 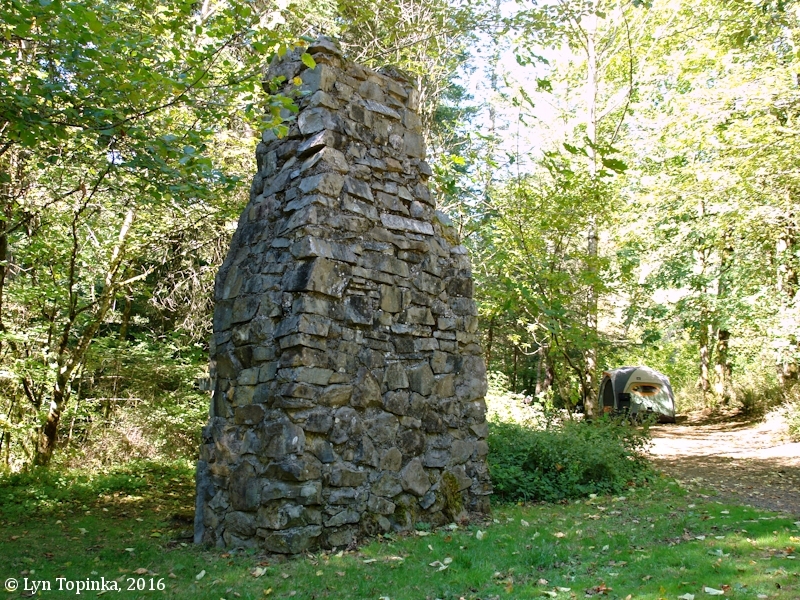 An unknown-purpose stone chimney sits between sites 16 and 17. This campground is not built to accomodate todays RVs. 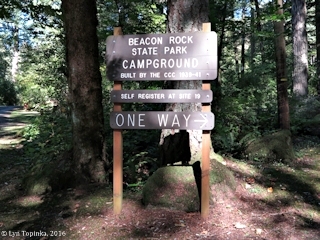 Click image to enlarge Sign, Beacon Rock Campground, Beacon Rock, Washington. Image taken September 26, 2016. 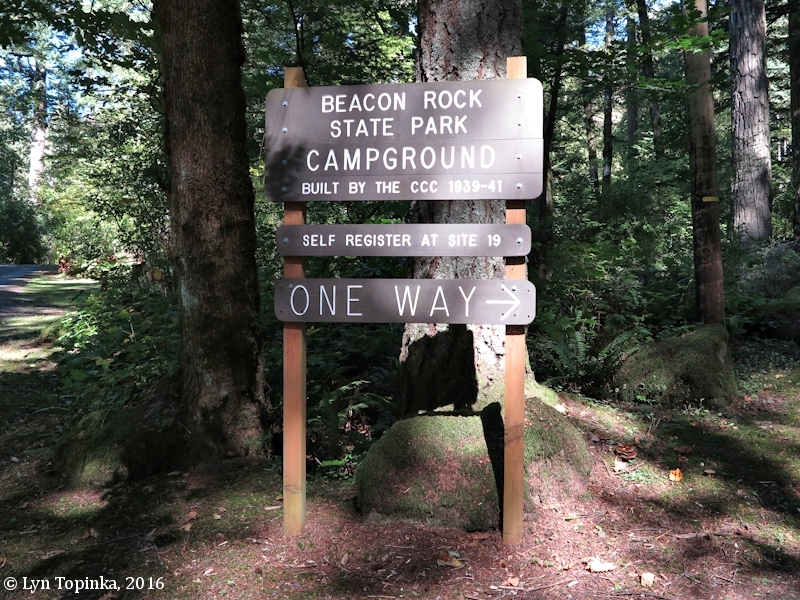 Click image to enlarge Camp site #1, Beacon Rock Campground, Beacon Rock, Washington. Image taken September 26, 2016. 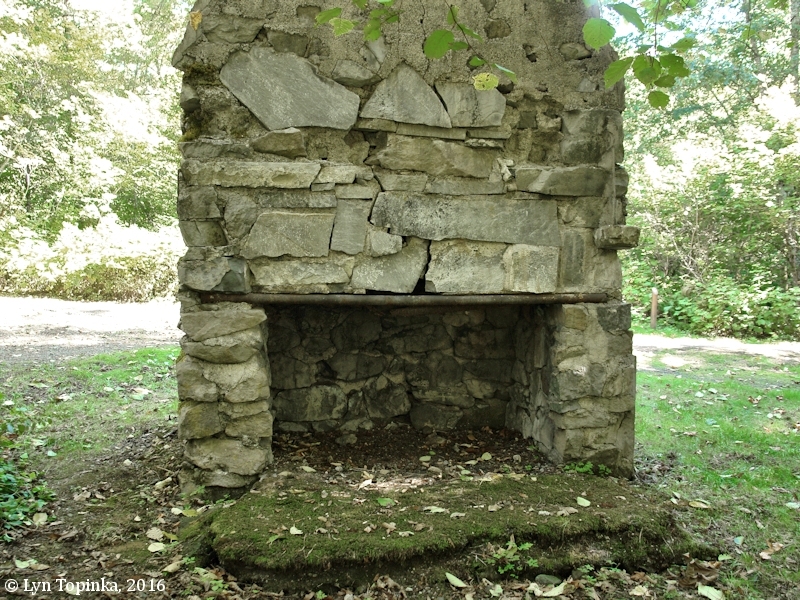 Click image to enlarge Stone Chimney, Beacon Rock Campground, Beacon Rock, Washington. View as seen from the campground road. This chimney is between camping spots 16 (seen on right) and 17. Image taken September 26, 2016. 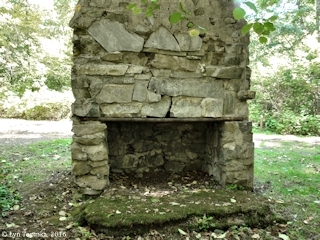 Click image to enlarge Fireplace, Stone Chimney, Beacon Rock Campground, Beacon Rock, Washington. View as seen while standing at edge of small gully. Image taken September 26, 2016. On April 6, 1806, the Lewis and Clark expedition once again spotted Beacon Rock on their journey back home, and this time their journal entries use the name "Beacon Rock". Captain Lewis comments that Beacon Rock is the upper end of the ocean's tidal effect. 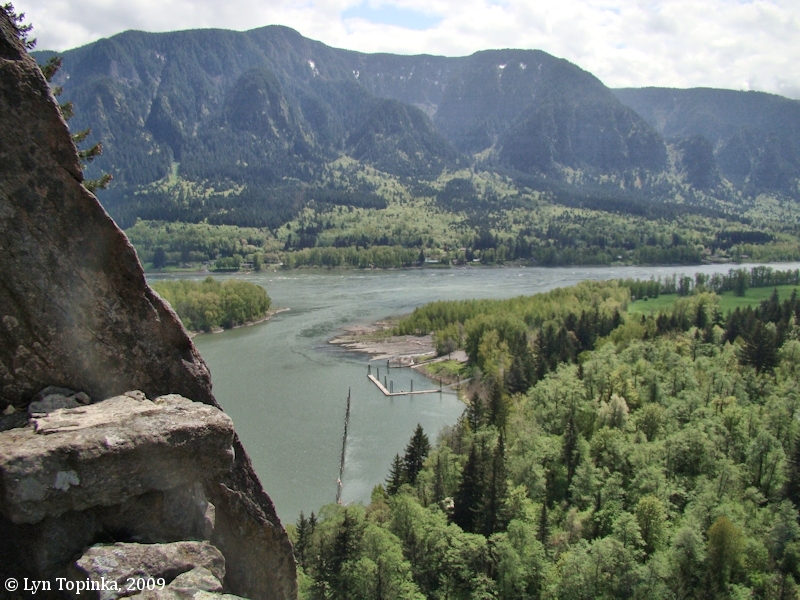 On April 9, 1806, Lewis and Clark journeyed passed Beacon Rock on their way upriver. The "marshy islands" mentioned in Lewis's April 6th passage, today are a part of the Lewis and Clark National Wildlife Refuge, upstream of Astoria, Oregon. Click image to enlarge Beacon Rock, Washington, as seen from the boat ramp near Dodson, Oregon. Image taken October 22, 2005. Click image to enlarge Beacon Rock, Washington, as seen from Dalton Point, Oregon. Image taken June 27, 2004. Lewis and Clark first spotted Beacon Rock on October 31, 1805, as they were portaging around the rapids caused by the Table Mountain Landslide. 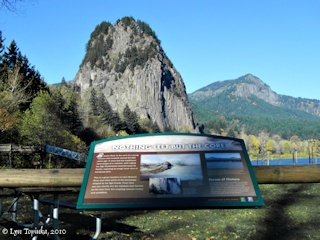 The men passed by Beacon Rock on November 2, 1805. In their 1805 journals, Clark called the rock "Beaten Rock". 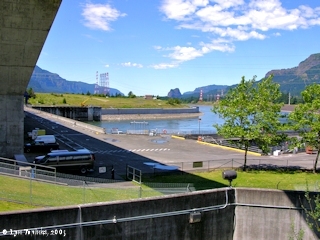 Good upstream views of Beacon Rock can be seen from Bonneville Dam, Hamilton Island, and the mouths of Tanner Creek and Eagle Creek. Click image to enlarge Beacon Rock, Washington, as seen from Hamilton Island, Washington. Pierce Island is visible on the left. Image taken April 2, 2005. Click image to enlarge Beacon Rock, Washington, as seen from Bonneville Dam, Washington side. Image taken June 19, 2005. Click image to enlarge Bonneville Dam and Beacon Rock, Washington, as seen from the mouth of Eagle Creek, Oregon. Image taken November 29, 2009. Beacon Rock State Park is located in Washington State, 35 miles east of Vancouver, Washington. 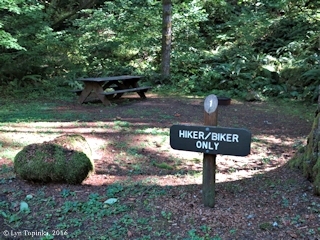 The park is a 4,650-acre year-round camping park, which includes 9,500 feet of Columbia River freshwater shoreline. 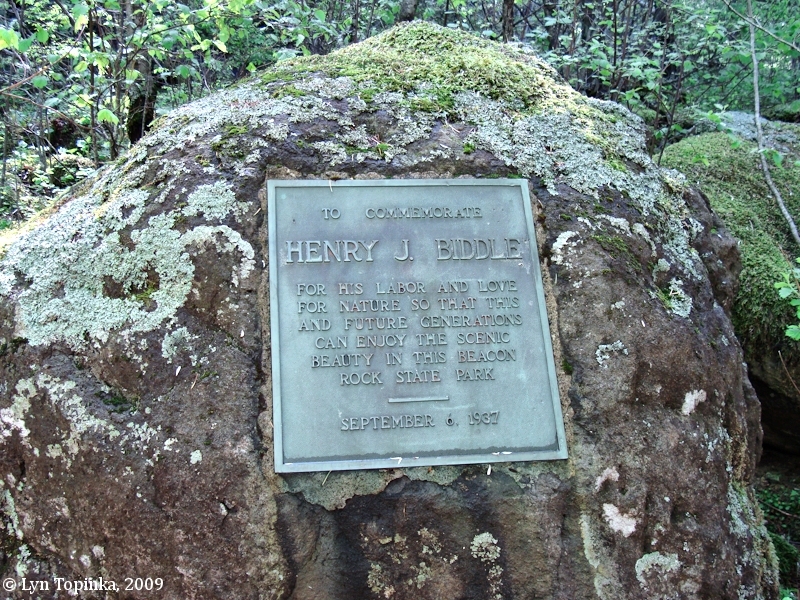 Henry J. Biddle purchased the rock in order to build a trail to the top. The trail was built, and in 1935 his heirs turned the rock over to the state for use as a park. Additional development was done by the Civilian Conservation Corps. Click image to enlarge Plaque, Beacon Rock State Park, Washington. Image taken May 3, 2009. "... Not counting winter breaks, it took two years starting in 1915 to construct a trail 4,500 feet long, 4 feet wide and including 52 switchbacks, 100 concrete slabs and, originally, 22 wooden bridges. "Some of the original ironwork is still there, especially on the turns," said Eric Plunkett, superintendent of Beacon Rock State Park. "And if you look real close, you can find old steel eye bolts in the rock." 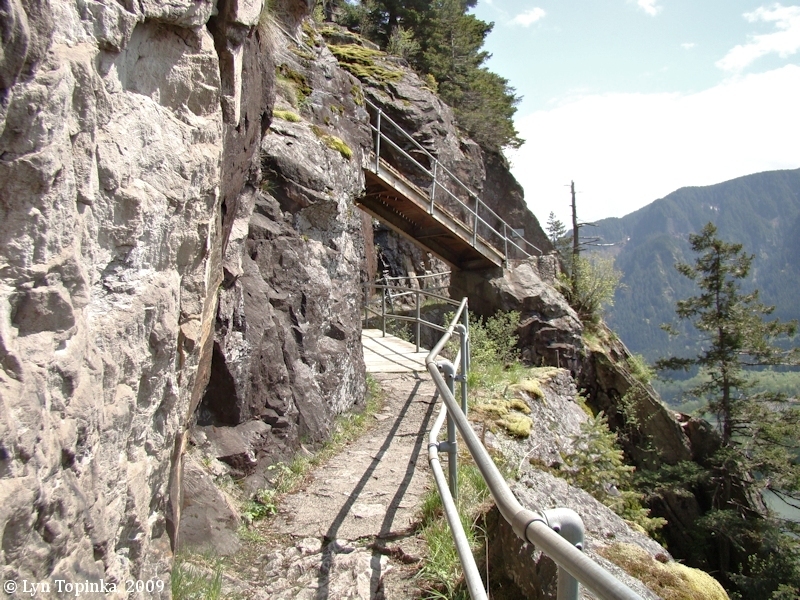 The wood bridges have long been replaced and the rock walls lower down rebuilt, though from the same rock. The original cable was replaced in the 1950s by a handrail. 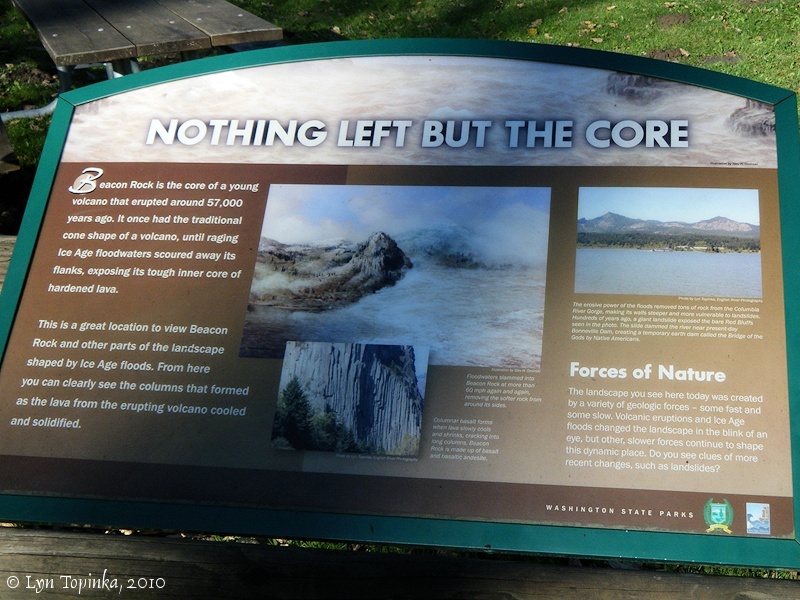 ..."
Click image to enlarge Plaque, Beacon Rock trail, Washington. Image taken May 3, 2009. 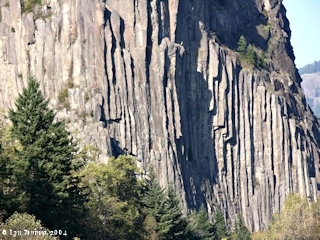 Click image to enlarge Beacon Rock trail, Washington. Image taken May 3, 2009. Click image to enlarge View, Beacon Rock trail, Washington. Image taken May 3, 2009. Spot the climber, in red. Images taken from Warrendale, Oregon. 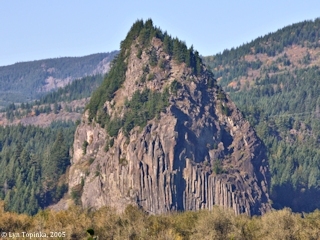 Click image to enlarge Beacon Rock, Washington, as seen from Warrendale, Oregon. Image taken October 22, 2005. Click image to enlarge Beacon Rock basalts as seen from Warrendale, Oregon. Note climber in red !!!!!!!!! Image taken October 22, 2005. Along the Columbia beginning at the base of Beacon Rock and heading upstream is the Pierce National Wildlife Refuge. Pierce Island lies just offshore along the Washington side of the Columbia. Click image to enlarge Columbia River from Beacon Rock. Image taken October 27, 2004. Click image to enlarge Columbia River from Beacon Rock. Pierce Island is on the right. Image taken September 26, 2016. The early 1900s was the "Golden Age of Postcards". The "Penny Postcard" became a popular way to send greetings to friends and family. Today the Penny Postcards have become a snapshot of history. Click image to enlarge Penny Postcard: Beacon Rock ("Castle Rock"), on the Columbia River, ca.1908. Penny Postcard, Postmarked 1908, "Castle Rock on Columbia River, Winter Scene". Published by M.R.L.A. Made in Germany. Card #2968. Card is postmarked August 29, 1908. In the private collection of Lyn Topinka. Click image to enlarge Penny Postcard: Winter Scene, Beacon Rock ("Castle Rock"), on the Columbia River, ca.1908. Penny Postcard, Postmarked 1908, "Castle Rock on Columbia River, Winter Scene". Published by Sprouse & Son, Importers and Publishers, Tacoma, Wash. Postcard has postmark of 1908. In the private collection of Lyn Topinka. Click image to enlarge Penny Postcard: Beacon Rock ("Castle Rock") with Fish Wheel and Row Boat, ca.1910. Penny Postcard, ca.1910, "Castle Rock, Columbia River, Oregon." Published by Detroit Publishing Company. Card #5556. In the private collection of Lyn Topinka. Click image to enlarge Penny Postcard: Beacon Rock ("Castle Rock") and Hamilton Mountain, ca.1910. Printed in Germany. Card #5552. In the private collection of Lyn Topinka. Click image to enlarge Penny Postcard: Beacon Rock ("Castle Rock") on the North Bank Road, ca.1910. Penny Postcard, ca.1910, "Castle Rock on the Columbia River, On the North Bank Road." Published by Portland Postcard Co., Portland, Oregon. In the private collection of Lyn Topinka. Click image to enlarge Penny Postcard: Beacon Rock ("Castle Rock") and Hamilton Mountain, ca.1917. Penny Postcard, ca.1917, "Castle Rock, Table Mountain in the Distance, Columbia River. Seen from the Highway." This is in error as it is Hamilton Mountain in the background. Published by Chas. S. Lipschuetz Company, Portland, Oregon. Card is postmarked 1917. In the private collection of Lyn Topinka. Click image to enlarge Penny Postcard: Fishwheel on the Oregon side of the Columbia, across from Beacon Rock, Washington, ca.1920. Penny Postcard, ca.1920, "Fish Wheel, Seen from the Columbia River Highway." Published by Lipschuetz and Katz, Portland, Oregon. Card #386. In the private collection of Lyn Topinka. S. 50° W. 5 miles to a timbered bottom on the Lard. Side, passed the Lowr. point of Strawbery Isd. [Hamilton Island] at 3 miles, a Isd Covd with wood below on Stard. Side a remarkable high rock on Stard. Side about 800 feet high & 400 yds round, the Beaten Rock. [Beacon Rock] The mountains and bottoms thickly timbered with Pine Spruce Cotton and a kind of maple Passed 2 Small wooded Islands on Std. Side [Pierce and Ives Islands], below the lower Island on the Stard. Side at 4 miles an Indian village of 9 Houses. The river wider and bottoms more extencive. This morning we had the dryed meat secured in skins and the canoes loaded; we took breakfast and departed at 9 A. M. we continued up the N. side of the river nearly to the place at which we had encamped [Rooster Rock] on the 3rd of Nov. [in error, their camp of November 2, 1805] when we passed the river to the south side in quest of the hunters we had sent up yesterday and the day before. from the appearance of a rock [Rooster Rock] near which we had encamped on the 3rd of November last [in error, November 2, 1805] I could judge better of the rise of the water than I could at any point below. I think the flood of this spring has been about 12 feet higher than it was at that time; the river is here about 1½ miles wide; it's general width from the beacon rock [Beacon Rock] which may be esteemed the head of tide water, to the marshey islands [near the mouth of the Columbia River, today part of the Lewis and Clark National Wildlife Refuge] is from one to 2 miles tho' in many places it is still wider. it is only in the fall of the year when the river is low that the tides are persceptable as high as the beacon rock [Beacon Rock]. this remarkable rock which stands on the North shore of the river is unconnected with the hills and rises to the hight of seven hundred feet; it has some pine or reather fir timber on it's nothern side, the southern is a precipice of it's whole hight. it rises to a very sharp point and is visible for 20 miles below on the river. at 2 oClock P. M we Set out and passed under the Beacon rock [Beacon Rock] on the North Side of two Small Islds. [Pierce and Ives Islands] Situated nearest the N. side. 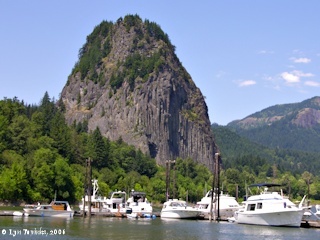 at 2 P. M. we renewed our voyage; passed under the beacon rock [Beacon Rock] on the north side, to the left of two small islands [Pierce and Ives Islands] situated near the shore. Biddle, H.J., 1924, "Beacon Rock on the Columbia, Legends of Traditions of a Famous Landmark", a monograph written for "The Spectator", Portland, Oregon, courtesy Oregon State Libraries, 2016.